A major hurdle facing the residents of Pakistan’s Federally Administered Tribal Areas (FATA) is the century-old colonial law that still governs it—the 1901 Frontier Crimes Regulation (FCR). Harrison Akins gives a brief overview of the FCR’s history and structure, followed by an analysis of the current opposition to the government’s plan for reforming FATA’s legal framework. 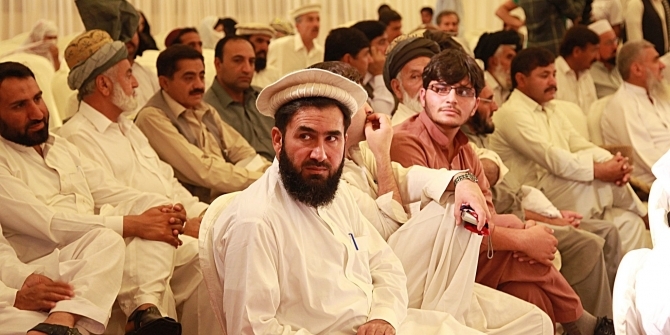 Emerging from the turmoil of over a decade of Taliban attacks, military operations, and U.S. drone strikes, tribesmen from Pakistan’s Federally Administered Tribal Areas (FATA) are now making their voices heard in a movement lauded as the “Pashtun Spring”. With over 1.4 million people re-settled since 2009 following years of displacement, many innocent Pashtun have felt stereotyped and targeted by the government, as their homeland remains affected by extremism. This fact was laid bare by the January 2018 killing by police of a Pashtun shopkeeper Naqeebullah Mehsud in Karachi. In response, thousands of young Pashtun marched in the streets of Islamabad, dubbed the “Pashtun Long March”, clamouring for justice and their full rights as Pakistani citizens. However, a major hurdle facing the residents of this border region is the century-old colonial law that still governs it—the 1901 Frontier Crimes Regulation (FCR). The FCR severely curbs FATA inhabitants’ rights, permitting the government to enact collective punishment, displace villages without compensation, and arrest individuals for up to three years without charges. Nasirullah Khan Wazir of the Pakistan Tehreek-e-Insaaf party and from South Waziristan Agency called the FCR “a black law dating back to the colonial era…It is inhuman and tribesmen have consistently been rejecting it. Tribesmen no longer want to live under its tyranny.” This essay will provide a brief overview of the FCR’s history and structure, followed by a discussion of the current opposition to the government’s plan for reforming FATA’s legal framework. Set amidst the Great Game in which the UK and Russia jockeyed for position in Central Asia, the British implemented the FCR in 1901 strictly to maintain law and order in the strategic northwest border region with Afghanistan and keep its tribes ‘on side’. The law maintained the internal autonomy and customs of the Pashtun tribes, legally recognising the authority of the malik (elder) within the jirga (council of elders) to make decisions and providing them with an allowance. The colonial authorities also dispatched a political agent (PA) to represent British interests. Granted almost unlimited legal authority, the PA simultaneously served as chief of police, judge, and executioner, backed by the ever-present threat of military force. Given the limitations of government presence in the mountainous region, however, the PA found it necessary to work through tribal structures, further strengthening the role of the malik. At the creation of Pakistan in 1947, the FCR was maintained within FATA, despite its anti-democratic provisions. The government feared disrupting the status quo of the region given concerns over relations with Afghanistan, which had declared the Durand Line invalid and laid claim to Pakistan’s Pashtun regions, allying with India in the process. FCRwithin Pakistan It denied FATA residents their basic political and legal rights—appeal, wakeel (lawyer), and daleel (argument)—the right to appeal a conviction, the right to legal representation, and the right to present evidence. Universal suffrage was only introduced in 1997. Before this, only recognised maliks were allowed to vote. Derided by human and civil rights groups, the FCR left FATA in an enforced stagnation, limiting development and economic opportunities. In November 2015, the former Prime Minister Nawaz Sharif formed the FATA Reforms Committee, recommending a five-year plan to repeal the FCR and merge FATA with the neighbouring Khyber Pakhtunkhwa (KP) Province. Coming in the wake of a string of “Go, FCR, Go” protests calling for the implementation of the Committee’s recommendations, the Pakistani federal cabinet approved the plan in March 2017. The younger generation has, however, opposed this position and pushed for FATA’s expedited integration into KP. The tension between the elders and the youth date back decades. Anthropologist Akbar Ahmed, who served as political agent of South Waziristan Agency from 1978-1980, recognised during his tenure the distinction between the privileged elders and the “political have nots”. As early as the 1970s, the disadvantaged kashar (youth) were clamouring for a greater political voice in the face of elders reluctant to share their status and the personal benefits that accrued to them. Much of the younger generation today, as noted by Pakistani journalist Rehmat Mehsud from South Waziristan Agency, grew up outside of FATA while their families were displaced, seeing the opportunities available to the broader nation. Mehsud told me, “After getting education at urban centres of Pakistan, now, they are demanding the same facilities back at home [and] now asking questions as to why facilities are not available to them being enjoyed in the rest of country. They want a total repeal of FCR, access to justice system and all constitutional rights.” The All FATA Students Forum (AFSF), along with the All FATA Political Parties Alliance, has called for the integration of FATA into KP by the 2018 general elections, scheduled for July. These groups have similarly expressed doubt over the government’s five-year plan for gradual reform, which would replace the FCR with the Riwaj Act. Under this new law, the jirga system would continue to be recognised with critics fearing it could simply become another version of the FCR. Harrison Akins is an LSE alum (MSc ’10) and currently a graduate research fellow at the University of Tennessee’s Howard H. Baker, Jr. Center for Public Policy. Bad Behavior has blocked 330 access attempts in the last 7 days.